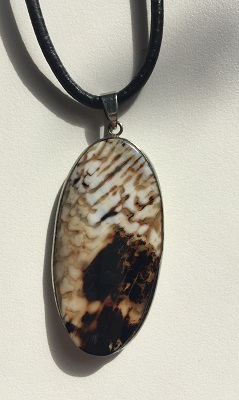 Beautiful with dynamic patterns of brown and creamy tan colors polished Agate pendant from Brazil. 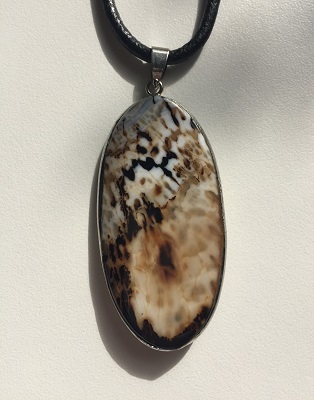 Agates are grounding, soothing and calming crystals creating emotional, physical, and intellectual balance. Brown Agate may aid with centering and stabilizing physical energy due to its grounding energetic vibrations. 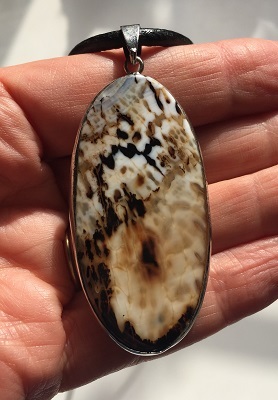 Brown Agate recharges and reinforces your personal connection to the earth. Use the energies of Brown Agate to renew your intentions of living a well-balanced and abundant life. Brown Agate helps to release feelings of anger and fosters love and the willingness to start again. Brown Agate gives one strength and the courage to face discouraging circumstances and overcoming perceived fears. 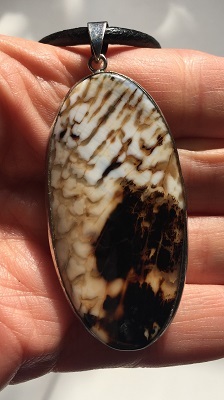 Brown Agate raises awareness and levels of consciousness. Brown Agate may be helpful in the assimilation of life experiences that result in spiritual growth, inner stability, and self-confidence. In healing, Brown Agate may be used to stimulate the appetite and support a “back to basics” sensible approach to life style changes. A powerful throat healer, Agate energetically clears blocked areas of self-expression and releases shoulder and neck tension and problems.